We changed a lot in this iteration of HealthStart. We moved away from simply giving to schools and moved to enabling schools to identify and act upon change for themselves. This reflects who we are as an organisation - we don’t want to merely cover problems with sticking plasters in the short term. We want to build lasting and effective change that will impact upon a children’s prospects forever. To achieve this, we’ve focused on helping schools to find solutions from within their own communities. We took an effective programme, introduced some innovations and removed some of the biggest costs to enable us to scale. We’re over halfway through and we’re seeing some really interesting results. We’ve had a few challenges, particularly with the political landscape changing goalposts within government departments, but with our partners Omega and Ogra, we’ve achieved a huge amount. We've developed training courses for school leaders in all our schools, to make sure they understand their responsibilities. This training helps us asses what change needs to happen, but also means that our leaders know that they are are able to, and have a resposibility to, empower thier communities to create change. 152 school leaders including headteachers, Boards of Management, health teachers, class teachers, school sponsors and Parent Teacher Association members undertook governance training. It focused on the roles and responsibilities of the school management, mediation, governance models, how to influence school health and sustainable practices. Following this training, each school created a School Health Committee with members from school and relevant local governmental departments. These committees, with 120 participants, then received training on school health. The course gave an overview of School Health Policy and guidelines, outlined the importance of health programmes in a school setting, then provided more detail on themes within the policy - which include, amongst others, gender, child rights, water and sanitation, nutrition and disease prevention and control. Since the training, the schools have been receiving regular mentorship and support to help them to have discussions with the whole school community about the needs for their school. We’ve seen some really interesting results from the schools. Many of the comittees have worked together to identify and prioritise their needs, then to find solutions from their local communities or from local government sources. Two of the schools have increased the number of latrines for children. Awasi Primary School wrote to their local Community Development Fund following their school health training and were successful in their application. The two new toilets are due to open at the beginning of term 3 in 2017. Milenye Primary School chose a different approach and brought the community on board to help provide new toilets for pupils. In March 2017 the school held a fundraising day for parents and community members. They managed to raise over 40,000 Kenyan Shillings (around $400) which they’ve used to purchase cement and bricks. They’re currently looking for donations from local fundis (tradesmen) to come and build the latrines for them. Other schools have concentrated scarce resources from the Ministry of Health into health and sanitation issues following HealthStart training. These include using funds to purchase new or fix old handwashing stations, like Nyangoma and Simbi-Luora primary schools. There are some interventions that HealthStart has supported the schools with. The areas that we work in receive national annual distributions of medication for worm infections. However, the prevalence rates in these regions are particularly high and the World Health Organisation recommends that children living in these regions receive at least two treatments per year. 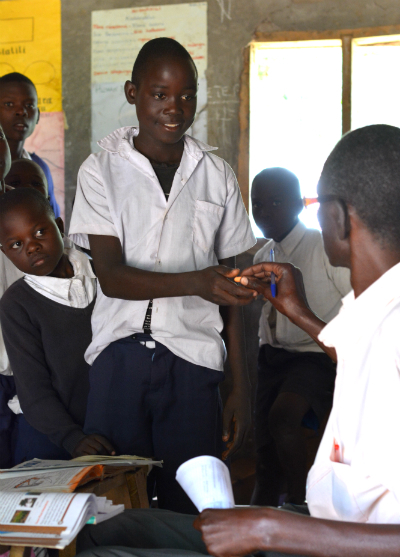 In July 2017, Child.org and Ogra worked together to distribute a second dose of the deworming medication received from the Kenyan Ministryof Health to nearly 10,000 children. The team enabled the schools to deliver the medications themselves, while collecting data on who received medication for us to share with parents. The data from the distribution will also be included in the Kenyan national health database. The HealthStart schools are located in malaria endemic regions. There are various organisations that work to improve access to nets and educate people on how to avoid exposure. Rather than wasting scarce resources by providing whole schools with nets, the relationships with the schools enables the HealthStart programme to identify the most vulnerable cases and to ensure that those children are the ones to receive treated bednets. Earlier in 2017 we weighed and measured all the children in all the schools. We want schools, parents and medical services to know who the vulnerable children are; by identifying children that are either malnourished or are at risk of being malnourished in the near future, we can strengthen school to clinic referral processes meaning that children can more easily access government support. This was supported by nutritional training for parents to learn about a balanced diet and the impacts of undernutrition and overnutrition. Whenever a school or child is provided with an intervention, we ensure that the needs and solutions are discussed with parents. In doing so, we intend to improve parental understanding of health issues and how to avoid preventable diseases. In the HealthStart regions, we’ve included parents and caregivers in every step of the process. At the very start of the programme we invited parents to open forums with teachers and the school pupils. We engaged all parties in open dialogue about the health issues that mattered to them and they heard from each other about their needs and what they wanted to know more about. These sessions and requests have guided the interactions at the schools meaning that support and information is tailored to the needs of a particular environment. Parents have also received sessions on hygiene and sanitation, nutrition and the importance of good communication between them and the school concerning the health of their children. They will also receive a session on malaria, pneumonia and other infectious diseases later in the year. The purpose of these sessions is to ensure that parents are included in managing the health of their children and to ideally result in behaviour change which will ultimately mean that fewer children fall sick. We’ve recently been hearing from teachers about the results they’ve been seeing. Mercy, Health Teacher at Akwanya Primary School told us that community awareness around the importance of good hygiene has impacted upon children’s health in her primary school; “the children are coming to school cleaner than before”. HealthStart is a complex programme. We’re trying to do a huge amount with little, in an already-complex environment. Long term solutions need foresight, planning and investment. HealthStart provides all of these and by tackling the complex problems from a number of angles, with a number of groups we’re beginning to see change happen.